Summary: Researchers report older women living in areas with fine particulate matter exceeding the EPA’s standard are at significantly higher risk of developing dementia. USC-led study suggests that tiny, dirty airborne particles called PM2.5 invade the brain and wreak havoc. Tiny air pollution particles — the type that mainly comes from power plants and automobiles — may greatly increase the chance of dementia, including Alzheimer’s disease, according to USC-led research. The adverse effects were stronger in women who had the APOE4 gene, a genetic variation that increases the risk for Alzheimer’s. NeuroscienceNews.com image is credited to Meg Rosenburg. Funding: The air pollution study, the Women’s Health Initiative and WHIMS are collectively supported by the National Institute on Aging of the National Institutes of Health; the Southern California Environmental Health Sciences Center; the National Heart, Lung, and Blood Institute; the U.S. Department of Health and Human Services; Wyeth Pharmaceuticals Inc.; St. Davids, PA, and the Wake Forest School of Medicine; and the Cure Alzheimer’s Fund. Image Source: NeuroscienceNews.com image is credited to Meg Rosenburg. Video Source: Video is credited to Meg Rosenburg/USC Davis School of Gerontology. USC “Air Pollution May Lead to Dementia in Older Women.” NeuroscienceNews. NeuroscienceNews, 31 January 2017. 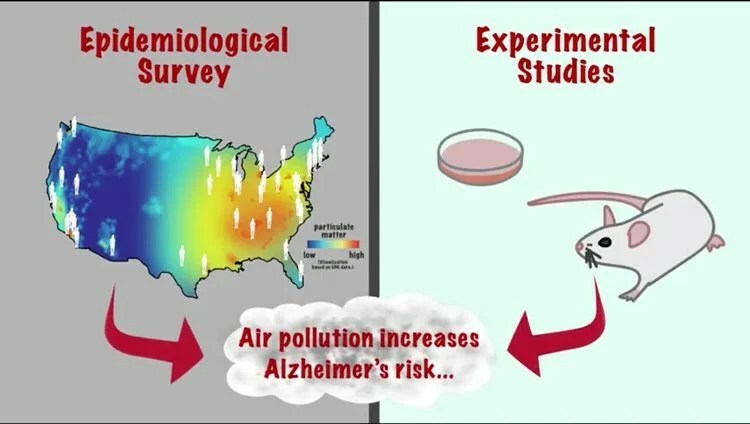 USC “Air Pollution May Lead to Dementia in Older Women.” http://neurosciencenews.com/air-pollution-women-dementia-6031/ (accessed January 31, 2017). Exposure to particulate matter (PM) in the ambient air and its interactions with APOE alleles may contribute to the acceleration of brain aging and the pathogenesis of Alzheimer’s disease (AD). Neurodegenerative effects of particulate air pollutants were examined in a US-wide cohort of older women from the Women’s Health Initiative Memory Study (WHIMS) and in experimental mouse models. Residing in places with fine PM exceeding EPA standards increased the risks for global cognitive decline and all-cause dementia respectively by 81 and 92%, with stronger adverse effects in APOE ε4/4 carriers. Female EFAD transgenic mice (5xFAD+/−/human APOE ε3 or ε4+/+) with 225 h exposure to urban nanosized PM (nPM) over 15 weeks showed increased cerebral β-amyloid by thioflavin S for fibrillary amyloid and by immunocytochemistry for Aβ deposits, both exacerbated by APOE ε4. Moreover, nPM exposure increased Aβ oligomers, caused selective atrophy of hippocampal CA1 neurites, and decreased the glutamate GluR1 subunit. Wildtype C57BL/6 female mice also showed nPM-induced CA1 atrophy and GluR1 decrease. In vitro nPM exposure of neuroblastoma cells (N2a-APP/swe) increased the pro-amyloidogenic processing of the amyloid precursor protein (APP). We suggest that airborne PM exposure promotes pathological brain aging in older women, with potentially a greater impact in ε4 carriers. The underlying mechanisms may involve increased cerebral Aβ production and selective changes in hippocampal CA1 neurons and glutamate receptor subunits.